L-GRID is a solution which increases efficiency of your storage and your core network. L-GRID is a software component which works together with selected network cards. It runs on high speed network endpoints (clients/servers) that send data to lower speed endpoints. L-GRID cancels out the speed mismatch between high speed and lower speed endpoints. Deploying L-GRID will help lowering the required network investments in the core network. In present network setups high performance nodes are often equipped with high speed network cards: e.g. 10 Gbit/25 Gbit/ 40 Gbit/100 Gbit/.... This situation reduces the cabling complexity of the nodes but creates an end-to-end speed-mismatch with lower-bandwidth clients. This leads to oversubscription in the connecting network. In order to optimize storage nodes for performance, data is fetched from disks in large blocks. The high speed endpoints send this traffic in large bursts into the network: these are large packet trains (packets sent back-to-back on the link) which run at full line rate. When such a burst arrives at a speed-mismatch in the network (e.g. a 10 Gbit connected storage server sending traffic to a 1 Gbit connected client), a possible bottlenecks occurs. To avoid packet drops, the network needs to buffer a large amount of the burst because there simply isn’t enough bandwidth available to send the data directly to the client. In many networks a limited amount of buffer space is available. When a lot of low speed clients are connected to a lot of high speed servers, this buffer space will be used increasingly until the entire buffer is full, and eventually packets will be dropped. When a packet is being dropped in the network, congestion avoidance mechanisms of TCP typically kick in. The sender has to re-transmit data, transmission rates are being lowered or dropped (slow-start mechanism) and the possible throughput will be lower and a lot of the efficiency is lost. The frequent drops in your network will lead to erratic behavior and unpredictable performance. L-GRID tackles the problem of speed mismatches at the source and avoids an extra investment in large buffer core switches. L-GRID will configure the network card to only allow bursts of the configured bandwidth. Data flows to the preconfigured destinations are sent out of the network card perfectly shaped to the given bandwidth. 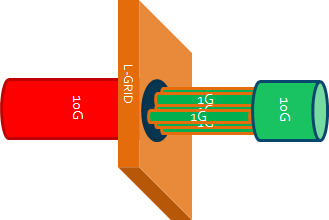 As the L-GRID eliminates bursts before they enter the network, no exhaustive buffer space is required from the connected switches. The traffic is controlled/managed at the source. The cause for congestion is remediated before it can happen. L-GRID will thereby improve the efficiency of your installed network.